Love the product I ordered from your company. Will Be ordering more. 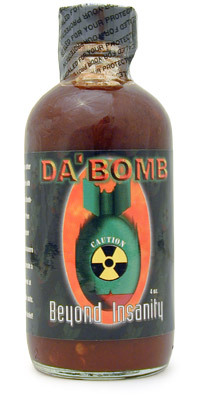 This sauce is Hot AS F@&K lol! But I loved every minute of it. Me and my family had a hot wing challenge of who could get through the hottest of hot sauces and this one brought us all to our knees. This hot sauce is great!!!. Just the right flavor and a lot of heat. Perfect for parties or solo dining. I am definitely going to be getting more soon. The "Beyond Insanity" sauce has been my go-to hot sauce for about a decade. I most like that it's not vinegary, as I don't like vinegar. It's got a nice pepper flavor, though I rarely taste that because it's so hot I don't use very much. I'm delighted that I found this sauce. This is one of my favorite sauces. The heat is intense, but there are a lot of sauces with crazy heat. More importantly is the flavor, which is great! I mix this with BBQ sauce to dip wings in and Tzatziki sauce for Gyros and it's amazing! Good stuff! I use to spend about $700 a year on hot sauce, but now I just mix this with 40/50 with Tapatio. Now I spend $20 a year, Hot! On my 3rd bottle. We use this at the Fire Station for cooking, and if someone is willing, as some entertainment. Last summer I decided to try it so we got a celery stick and loaded the hot sauce on it and I ate it all. If you wanna get torn up and score with the ladies, this is the way to go! I DON'T COOK WITHOUT THIS PRODUCT. IT'S GREAT. This sauce has a realy nice flavor, but you might want to use a tooth pick to eat it with, because it is hot.